Ginny has taught her program through one on one counseling, group counseling, and has been a guest speaker at meetings and on the radio. Her quest for knowledge and its practical application continues to this day. Start to feel relief NOW! Order the Kindle ebook from Amazon today! If you are suffering from panic and anxiety attacks, agoraphobia, excess stress or post traumatic stress, be assured that you are NOT beyond hope! You needn't suffer any longer! There is hope and help available. Start to feel relief NOW! Do you feel like you are out of control? Do you feel like you may be losing your mind? Do you often feel terrified and as if you may be in great danger? Does your heart race wildly and your legs feel jelly like and weak? Do you take shallow, panting breaths? Do you have trembling spells? Do you experience frequent stomach upsets? Do your negative thoughts run wild? Do you imagine the worst that can happen and live with dreaded anticipation? Ginny has recovered from both panic (anxiety) attacks and agoraphobia. She became a peer counselor over twenty years ago and has taught countless people how to recover and go on to lead calmer and better lives. It is rare to find a program such as this that is both informative and inspirational. This program differs from others because it teaches you how to work with body, mind and spirit. Many programs miss this vital link. You'll discover how creative your thoughts are and the importance of learning how to think and behave differently. People refer to this as The Real Secret. Let Ginny's mp3's help you make it through your next shopping trip. Download these 2 FREE companions and place them on your mobile device so that you have help close at hand wherever you are. Just click on the link to listen here on the computer - or to save these to your computer and put them on your mobile device, right click on the title and choose the option to 'save as'. Peggy T. - Your techniques were so easy to put into practice. They helped me get through the most insecure and anxious time of my life. This information can help anyone learn to relax and enjoy a fuller life. I am presently teaching others who don't even suffer from panic, how to use these same principles to de-stress. We could all use some help in this crazy fast paced world. DB - I heard you speaking on the radio and at once felt a connection with you. You described what your life had been like when you suffered from panic attacks and agoraphobia. You told us that there was hope and help for everyone, no matter how old or young you are or for how long you have suffered. I can still hear you saying, "it's going to be alright!" And wonder of wonders, It Is! Thank you for all your help and guidance. I think it's great that you turned your suffering into something positive and have gone on to help others find their way. Diane W. - I read an article about you in the newspaper and contacted you. That was a lucky day for me. My whole life changed as I followed your down to earth advice and teachings. Before that I had no idea what was causing my too frequent anxiety attacks. I was always dreading and anticipating the next attack. It was hard for me to work at my job. My life became a vicious circle of fear, depression and anxiety. I felt so hopeless. But now, I am happy to say, that I am panic free. I am able to work without that horrible anxiety. I can concentrate and focus again. Many, many, thanks to you. Annie S. - Thank you for giving me my life back. After hearing your story, I was really inspired. I knew at once that I'd found someone who had truly lived through the awful suffering, and found their way to healing. You weren't just teaching something that you only knew about secondhand. You understood just how I felt and what I was dealing with. You offered me a safe way out of the misery. Your information was so practical and easy to follow, that at last, I had the help and answers I had been searching for. I will always be grateful. J.D. - Any statement I could make to try and describe the depth of my fear would be an understatement. I was housebound for six long years. I had such severe panic attacks that I became phobic. I didn't feel safe enough to leave my home. I didn't believe that I would ever be well again. Then along came your "Better Way", and I learned to help myself. Your program is not only informative, but practical, safe, and easy to follow. A short time after I began using your simple techniques, I was actually back out in the world participating again. I feel safe and confident, knowing that I have the right tools and ammunition to not just overcome panic, but the means to prevent it as well. Thank you for sharing your experiences, knowledge and skills with us. God Bless You. Lil G. - I was taking a lot of medication for my panic attacks and depression. I desperately wanted to come off the drugs but couldn't imagine it being possible. Then, I began to work your program. You showed me how to change my lifestyle in order to recover and stay well. Even the small changes I made helped enormously. With your guidance and information and my doctor's help, my medication was gradually reduced as I became stronger and more confident. I am happy to say that I am now drug free and panic free. Life is good! Larry Y. - What makes your system so effective and valuable is in the way you deal with the present moment and give the tools for relief right now! I had been seeing a psychiatrist for many years, undergoing traditional therapy for panic and anxiety problems. All we ever did was "dig" deep in my psyche and try to figure out how I got to be the way I was. Unfortunately, it did little to help me relieve my present panic and fears. Then someone told me about your program and the success they had with it. I met you and started to learn how to "Plant" the right seeds of thought. Digging isn't enough. Planting produces results. I learned so much and finally understood how to really help myself. I am so indebted to you and the person who brought you and your wonderful program into my life. 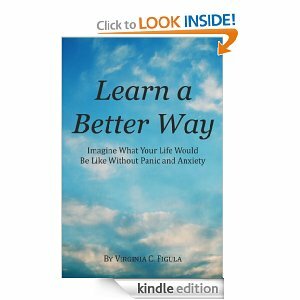 "Learn A Better Way' is only available on Amazon Kindle. I did this to keep costs at a minimum so that it could be priced reasonably. Amazon Kindle allows me to set its price so that all who are seeking help can afford it. Order the Kindle ebook from Amazon today!